This is about unanticipated consequences that began for skiing in the middle 1950s. That was when Alex Cushing, who owned Squaw Valley in California, put in a bid to host the Winter Olympics at Squaw Valley in 1960. At the time, Squaw Valley consisted of a handful of houses, three or four stores, a few ski lifts and a post office. I think Alex Cushing was as surprised as anyone when the international governing body of the Olympics awarded the 1960 Winter Games to Squaw Valley. Once the award was announced, the political wheels in California really began to rev up. Squaw Valley is located in the Lake Tahoe Basin and according to my memory, aside from a small resort called Granlibakken, with a single Poma lift, they were the only two ski resorts in the Tahoe Basin. The major reason for that was the lengthy, steep and winding two-lane road that switched back and forth up the western slope of the Sierra Nevadas to an elevation above 9,000 feet where annual snowfall averages between 30 and 40 feet. It is called Donner Summit. When you got over the summit it was a very scary, white-knuckle descent of about 4,000 vertical feet to Truckee. All of the east-west traffic from Northern California to anywhere east of Reno had to use this two-lane road. The 18-wheelers ground their way up the western slope of the Sierras at 6 or 7 mph. You had to just sit there in your car at the same slow speed because there was almost no place to pass them on either side of the summit. They had to keep their trucks in compound low going downhill at the same 6 or 7 mph. I cannot remember how long it took to drive over the pass, but it was way too long. Converting that narrow two-lane road to a four-lane freeway cost untold millions of dollars of the people in California, not to mention the federal government. It was designed so that anyone driving from anywhere west of Donner Summit could get to Squaw Valley in a lot less time so they could stand around in the deep snow and watch the Olympic competitions for a week or two and watch men and women race down the slopes of Squaw Valley with two things in mind: to collect an Olympic medal and make a lot of money on endorsements. The unanticipated consequence of cutting the drive time over the summit by at least 75 percent opened up the entire Tahoe Basin to the bigger populations centers of San Francisco and Sacramento to additional ski resorts and other commercial development as a result of the 1960 Winter Olympics. When I worked at Squaw Valley as a ski instructor during the winter of 1949-50, you could buy the best vacant lot in Squaw Valley with a fabulous view of Squaw Peak, and the prices were as high as $2,000 but most of them were only $1,000 and that was about the total price range. That same property today is worth untold hundreds of thousands of dollars, maybe millions, all because of Alex Cushing’s sales pitch to get the Winter Olympics, California and the federal government willing to build a lot of miles of four-lane freeway from San Francisco through Sacramento to Truckee. A couple of decades after the Olympics, the Lake Tahoe Basin was full of ski resorts such as Alpine Meadows, Heavenly Valley, Kirkwood, Incline Village, Homewood and Northstar. At the same time, real estate values around the basin have risen dramatically and the narrow two-lane road that encircles Lake Tahoe is jammed with cars, especially in the summer months during quitting time, when it slows down to a speed of sometimes less than 5 mph. Thousands and thousands of people now own vacation homes and condos in the Tahoe Basin, unlike their grandparents, who occupied two or three maybe even four small villages along the waterfront of the lake. Now the villages nearly meet and stretch around much more of the lake. I take the position that living in this kind of environment is a lot better than living in a city for thousands of different reasons. A lot of readers out there are very anti-growth in any mountain area. But remember, any person’s life is changed every time they spend any time on skis, so the more one can enjoy the mountains and share them, the better off humanity is. Hannes Schneider, truly the father of skiing, said once, “If everyone skied, there would be no more wars.” So true. There is some sort of a percentage, maybe less than 1 percent of Forest Service land in America, that is devoted to ski areas. 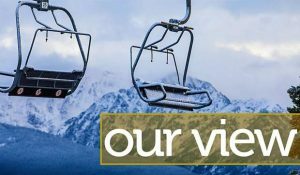 Talk to any one of the 15,000 people that ride the chairlifts at Squaw Valley on a given Saturday and all 15,000 of them would like to see the ski resort boundaries expanded. Unfortunately, the Forest Service has a different position on the availability of land for the ultimate freedom experience we all could enjoy. When Alpine Meadows was first developed in the mid-1960s, a chairlift came up to a saddle separating it from Squaw Valley and you could ski down into Squaw Valley. Squaw Valley had a chairlift that went up to that same saddle. However, it was 20 or 30 years before they had a lift ticket that you could use to ski in both resorts. Today, there is an inter-connect between Squaw Valley and Alpine Meadows so you can ski back and forth between them. It’s fun to start at one area and go for lunch in the neighboring one. Why not connect the top of the easternmost lift at Alpine Meadows with two more chairlifts and you would be in Homewood? I don’t not know how many airline miles that is, but now you would have a very unique European ski experience. You could park your car in Squaw Valley, have breakfast and then ski all the way to Homewood and have lunch on pier at Lake Tahoe. Or you could park at Homewood, have breakfast there, ski to Squaw Valley for lunch and return for your after-ski snack and beverages at Homewood. Unfortunately for you skiers out there, you will probably never see this kind of idea of closing the gap with resort development in America in your lifetime. I’m very fortunate because I have been witness to the explosive development of ski resort and equipment with freeway access to more and more mountain regions. Every person who moves to a ski resort is one less person who will be in front of you in the freeway traffic jam every morning on your way to work in beautiful downtown Metropolis. Here are two scary statistics: When I taught skiing at Squaw Valley in 1949-50, there were only four of us in the ski school, and on a crowded day each one of us was lucky to have a pupil, and management boasted that they had one of only two double chairlifts in the world. However, we did have two rope tows, one restaurant, one ski shop, two bars and accommodations for 42 people. In the winter of 1962-63 when Vail opened, I was there filming, and on one of those days they sold only eight, repeat, eight lift tickets. Today skiers and snowboarders on the hill at Vail on a midwinter Saturday or Sunday will total as many as 26,000. Ponder those growth numbers and try and figure out the future of skiing and snowboarding in America. Filmmaker Warren Miller lived in Vail for 12 years, and his column began in the Vail Daily before being syndicated to over 50 publications. For more of Miller’s stories and stuff, log onto WarrenMiller.net. For information about his foundation, The Warren Miller Freedom Foundation, go to http://www.warrenmiller.org. What’s on your mind? Share your insights with the rest of the community. What’s going well, not so well? Send your submission to ValleyVoices@vaildaily.com. By submitting a column, you are granting permission for the Daily to publish it on the paper’s website.